New bloggy header!! Hurray! 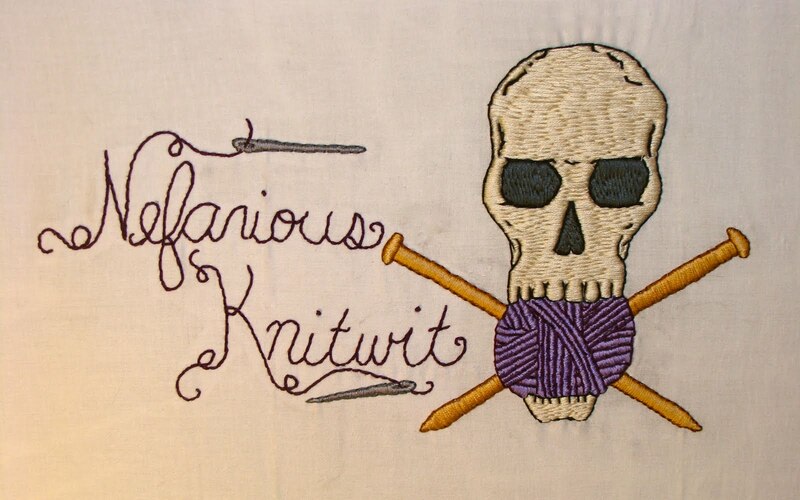 I stitched up this cutie with a yarn appetite just for this very blog you read. I'm not 100% on it as the header but I like it enough to keep it for awhile. By the way, this is the surprise project I finished. SURPRISE! The Work in Progress currently is Jared Flood's Rock Island Shawl. It's so beautiful and perty and special. I'm using the recommended Lorna's Lace in Grand Street Ink. Perfection. I started the border and finished 14 repeats, but I feel a rip coming on. Mistakes were made. Mistakes that I didn't even notice until a friend pointed them out and now it's all I can see! Every time I close my eyes all I see is mistakes! (I've just written mistakes so many times that that doesn't look correct to me either! Mistakes!!!!) Yes, I think I will rip it out and start again. Plus I lost my place in the pattern because I was too distracted at work in the lunch room. Booooo. I'm very easily distracted. This project will definitely be a home-only piece. So now what do I bring to work? I haven't thought that far yet, but I'll keep you posted. I just want to share this new little obsession of mine now. It's a mac app called ExpoBoard. Basically it's a bulletin board where you can pin post-it notes and pictures on it. This is perfect for a visually motivated person like myself. I've made multiple inspiration boards for knitting, embroidery, halloween costumes, etc. Awesomeness! I'm guessing it's just for macs but I could be wrong. I didn't exactly look into that since I am a mac addict. They have a lite version for free if you want to try it out. Find it in the App Store. Go. Go now. No, wait!!!! You have to finish my bloggy first. Go after. P.S. What are you're favorite apps and programs for crafting? Do tell! Your new header is awesome! I just can't do lace because I am unable to stay on track even with a lifeline. My favorite app in my iPad are my stitch counters. I don't know what I would do without them. Oh yes! I absolutely need my row counters in my Vogue Knitting App on my iPhone. Even then I manage to get lost. This is only my second attempt at lace but this pattern is definitely harder. Not insanely hard. Just hard enough that I have to pay attention!